Darwin Accommodation is a listing of independently owned and non-related hotels, motels and serviced apartments located across Darwin, Australia. Oz hotels Darwin allows you to deal directly with the hotels and apartments giving you the best possible rates for these Darwin hotels. Book your accommodation in Darwin online directly with the apartments and hotels and save! If you are travelling to Darwin for either business or pleasure you will find a wide range of fully furnished serviced apartments, hotels, motels and resorts to choose from. 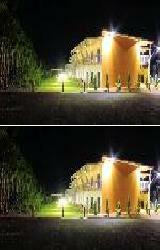 This large range can make choosing the most appropriate accommodation in Darwin a time consuming and frustrating task. For this reason many people prefer to use the services of an accommodation expert like OzHotels to help them find the right place that suits their particular needs. This way you can compare hundreds of different properties located right across Darwin, ensuring that you are able to find the one the meets your requirements and travel budget. The advantages of booking online with OzHotels is that you will be able to book up to 12 months in advance and that you will get an extra discount off the already cheap rates when you stay longer. So the next time that you are needing to book a business trip or holiday to Darwin save yourself time and money by booking directly with OzHotels. The Quest Apartments is one of Darwin's newest serviced apartment providers and offers business and holiday travellers a choice of studio, 1 & 2 bedroom self contained apartments. This exceptional Darwin CBD accommodation is ideally located in the heart of city centre close to shopping, restaurant, Mindil Beach sunset market and the picturesque coast line of Darwin. The superbly appointed serviced apartments will ensure your Darwin accommodation experience is a stylish and comfortable one. The Litchfield National Park is just 2 hours drive from the Quest Darwin and is a must see whilst you are staying in the Northern Territory. Complete with Quest's renowned personalised service, Quest Darwin Apartments is a great place to stay and a friendly welcome awaits both business and leisure travellers. The Value Inn Hotel is a locally owned and operated budget hotel that prides itself on offering great value for money Darwin accommodation combined with friendly staff who are more than happy to care for all your tour needs. Ideally located in the heart of the Darwin city the Value Inn is close to shops, restaurants, public transport, nightclubs, casino and tourist attractions. Holiday and business guests will love to stay at the Value Inn Hotel and experience the comfortable and cost-effective Darwin accommodation that also features a range of recreational facilities, including a delightful guest swimming pool with pool bar and access to the adjacent property's facilities which include 3 swimmimg pools, a waterfall spa, outdoor pool table, big screen TV and BBQ facilities. The fun loving staff at the Value Inn Hotel Darwin look forward to making your next stay in the Top End a relaxing and enjoyable one. The Mantra on the Esplanade in Darwin offers luxury hotel accommodation as well as 1, 2 and 3 bedroom self contained serviced apartments situated in an unrivalled location overlooking Darwin Harbour. The Mantra on the Esplanade in Darwin CBD is close to everything that the city has to offer, as well as having a numerous guests facilities and services including lounge bar, business centre, direct internet access, faxing facilities, guest laundry, lift, restaurant, room service, secretarial services, spa, outdoor swimming pool, tour desk, 24 hour reception, baby cots available and daily housekeeping. Mantra on the Esplanade Darwin Hotel & Apartments caters for business corporate guests as well as leisure travellers with hotel and apartment accommodation in an unrivalled Darwin location. The hotel accommodation, 1 & 3 bedroom self contained serviced apartments at the Signatures on Knuckey in Darwin provide executive accommodation with spectacular views of the Darwin Harbour. Ideal for holidaymakers, leisure, business and corporate travellers alike, The Signatures on Knuckey Apartments Darwin are centrally located in the heart of the Darwin CBD, within walking distance of all Darwin tourist attractions including the Smith Street Mall, Mitchell Streets cafes and nightlife, Darwin Harbour, Crocosaurus Cove, Darwin Entertainment Centre, Darwin Wharf Precinct and Cullen Bay Marina. The Signatures on Knuckey Darwin feature a wide range of modern amenities and services such as lounge bar, conference centre, free car parking, guest laundry, gym & fitness equipment, lift, massage, restaurant, sauna, spa, bbq, indoor pool, airport shuttle and security entrance. The luxury 1, 2, 3 & 4 bedroom serviced apartments at the Argus Apartments in Darwin offer self contained accommodation in the heart of the Darwin CBD complete with waterviews. Why squeeze into a hotel room, when you can relax in a fully self-contained apartment and enjoy the added luxury of space. The Argus Apartments in Darwin is close to everything that the city has to offer and also features a wide range of modern amenities and services such as business centre, direct internet access, faxing facilities, guest laundry, fitness equipment, lift, outdoor swimming pool, tour desk, bbq, 24 hour reception and daily housekeeping. 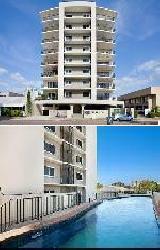 The Argus Apartments Darwin provides value for money, modern, hotel style service in spacious self contained apartments in in the Darwin CBD. The Darwin Deluxe Apartments offers quality 3 bedroom and 2 bathroom self contained apartments which are perfectly positioned along the beautiful Darwin Esplanade and right on the waters edge. This quality Darwin accommodation provides the perfect escape for families, coupleas and individuals who are after a tranquil place to stay whilst still being close to the hustle and bustle of the city. 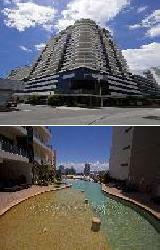 The Darwin Deluxe Apartments feature harbour and city views and are just a short stroll to the Darwin city mall, Darwin CBD and many other Darwin city attractions including restaurants, cafes, fashion outlets, nightlife entertainment, the Darwin Entertainment Centre, Fish Feeding, Crocosaurus, Wharf Precinct and the Darwin Convention Centre & Wave Pool. They are also only a short drive to the famous Sunset Mindil beach markets, the Skycity Casino and the Darwin Museum and Art Gallery. Darwin Deluxe Apartments offer a range of facilities and services for guest convenience, including Free undercover car parking, outdoor swimming pool, BBQ facilities and entertainment area, gym and fitness centre, landscaped gardens, lift, tour desk, luggage storage, faxing facilities and airport shuttle. The Darwin Deluxe Apartments offer centrally located, luxury accommodation in Darwin for the discerning corporate and leisure guest. 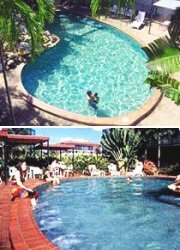 The Club Tropical Resort is situated in Lee Point, Darwin and provides quality hotel accommodation, as well as stylishly furnished 1 & 2 bedroom self contained apartments. The property is ideally set amongst 70 acres and gives you the feeling of being in the remote top end, yet minutes away from the Darwin CBD and Darwin's major shopping centre. 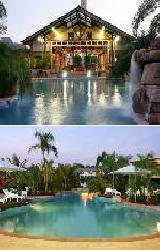 The Club Tropical Resort Darwin provides all types of travellers with discount accommodation in Lee Point. It also features a wide range of modern amenities and services such as lounge bar, business centre, conference centre, direct internet access, disabled facilities, faxing facilities, free car parking, guest laundry, restaurant, outdoor swimming pool, tour desk, bbq facilities, landscaped garden, airport shuttle, baby cots available and daily housekeeping. Quest Palmerston Serviced Apartments in Darwin, Northern Territory offers brand new studios, 1, 2 & 3 bedroom quality serviced apartments, ideal for the corporate traveller, extended stay, conferences, meetings, special events and leisure travellers. The Quest Palmerston Serviced Apartments is well positioned in Palmerston and is close to everything that the city has to offer. It also has numerous guest facilities and services including business centre, conference centre, direct internet access, disabled facilities, faxing facilities, guest laundry, gym & fitness equipment, lift, secretarial services, outdoor swimming pool, tour desk, bbq, garden, baby cots available, babysitting service and daily housekeeping. The Quest Palmerston Serviced Accommodation Darwin offers sophisticated and stylishly appointed serviced apartments at an excellent city location. The Alatai Apartments Darwin offers travellers the choice of rooms with affordable studio apartments as well as 2 and 3 bedroom self-contained fully-equipped apartments. These Darwin apartments are ideally located in a stunning courtyard setting, combining both an oriental and tropical theme. The guest facilities at this Darwin accommodation include a swimming pool, spa and barbecue surrounded by palms, tropical flowers and sweet smelling native shrubs. 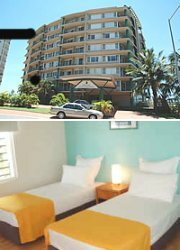 The Alatai Apartments Darwin is situated in the heart of the Darwin CBD, close to all of the city attractions and just a few minutes downhill walk to the beach, botanic gardens, Mindil beach night markets, casino and golf course. A further short stroll will take you to the general post office, city mall, shopping centre, cinema, city attractions, nightspots or to Port Darwin. Many of Darwin and the Northern Territory's major tourist attractions, including the Kakadu National Park are only a short drive away, or daily tours can be organised by the friendly and helpful staff at reception. At the Alatai Apartments Darwin you can enjoy traditional Chinese cuisine at Darwin's famous Dragon Palace licensed restaurant, open 6 nights a week, or enjoy the Garden Cafe for breakfast or a daytime snack and coffee. 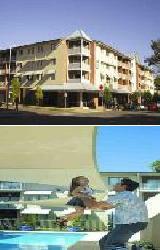 Apartment accommodation for either a long or short stay in Darwin. Recently opened the Quest Parap provides modern studio, 1, 2 & 3 bedroom self contained serviced apartments in Parap, which is only 5kms from the Darwin CBD. Bringing stylish and luxury accommodation to Parap for corporate and leisure travellers alike the Quest Parap in Parap is close to everything that the city or Darwin has to offer. It also has numerous guests facilities and services including conference centre, direct internet access, disabled facilities, faxing facilities, free car parking, guest laundry, gym & fitness equipment, lift, secretarial services, outdoor swimming pool, tour desk, bbq, airport shuttle, baby cots available, babysitting servicecw and daily housekeeping. The friendly staff at the Quest Parap Darwin Serviced Apartments will ensure that your stay is both comfortable and enjoyable. 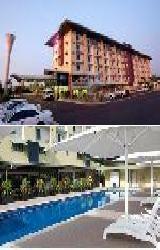 The Best Western Darwin Airport Gateway Hotel offers affordable Darwin airport accommodation in a fantastic location that is ideal that is ideal for leisure and corporate business guest alike. It provides a range of quality hotel rooms complete with all of the facilities to make your stay an enjoyable one, including Free airport transfers to and from the Darwin International Airport, your own private balcony, an outdoor swimming pool with pool bar, full breakfast room service, Free internet, tour desk and 24 hour reception. The Darwin Airport Gateway Motel is located just minutes from the Darwin airport and Darwin CBD, as well as being close to Royal Darwin Hospital, Marrara Sports Stadiums, Charles Darwin University, Darwin Convention and Exhibition Centre, Sky City Casino, Litchfield National Park and Kakadu National Park. 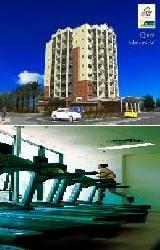 Hotel guests will also find great shopping at the largest shopping complex in Darwin, which is just 4 kms away. 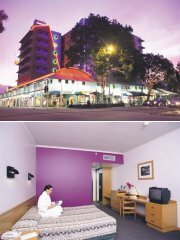 The Palms City Resort is conveniently located on the picturesque Esplanade in the heart of the Darwin CBD. It provides budget corporate and leisure accommodation in a range of motel rooms and free-standing villas surrounded by beautiful tropical gardens. The Palms City Resort overlooks the Darwin Harbour and is in close proximity to Parliament House, Mitchell Street with it's plethora of restaurants, pubs, nightclubs, night markets and entertainment centre, the Smith Street shopping district and the Deckchair Theatre open-air cinema. The various accommodation styles at the Palms City Resort range from standard motel rooms through to the Business Villas with outside Spa. At the Palms City Resort darwin guests are able to indulge in a true Top End experience with all the conveniences of home. The Discovery Holiday Parks Darwin offers Studios, 1 & 2 bedroom self contained cottages which are a tropical oasis located only 10 minutes from the heart of Darwin. This is the closest park to Darwin City and an essential destination during your Top End adventure. 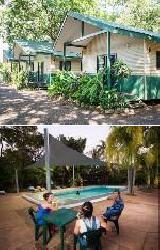 The Discovery Holiday Parks Darwin provides all types of travellers with discount accommodation in Darwin. It also features a wide range of modern amenities and services such as faxing facilities, free car parking, guest laundry, outdoor swimming pool, tour desk, bbq facilities, a landscaped garden, wifi/internet, luggage storage, non-smoking rooms, facilities for disabled guests and a designated smoking area. The Discovery Holiday Parks Darwin pride itself on providing customer service which is second to none, including the benefits of local knowledge. There are so many things to see and do, you'll be spoilt for choice! Make this your home while you explore the many unique attractions of the top end, with public transport on your door step. 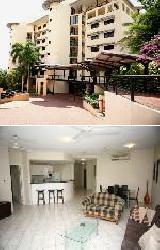 Signatures on Woods offers 1 and 2 bedroom self contained serviced apartments, overlooking Darwin Harbour. Ideally located in the middle of the Darwin City, The Signatures on Woods Serviced Apartments are a two minute walk from Smith Street Mall, a short walk from the many trendy cafes, restaurants located on Mitchell Street. The Signatures on Woods in Darwin CBD is close to everything that the city has to offer, as well as having a numerous guests facilities and services including direct internet access, free car parking, tour desk, non-smoking apartments, an indoor and outdoor swimming pool as well as a well equipped fitness centre. Further guest facilities and services include barbecue facilities and entertaining area, coffee shop, tours desk and on site restaurant. The Rydges Darwin Airport Resort is ideally located within 350 metres of the Darwin International Airport Terminal and situated midway between Darwin CBD and Darwin's major shopping centre at Casuarina. Rydges Darwin Airport Resort is one of newest accommodation hotels in Darwin offering guests the unique opportunity of enjoying resort style accommodation set amongst lush tropical gardens with a variety of styles to suit both the holiday maker and business guest alike. The Rydges Darwin Airport Resort is close to everything that the city has to offer, as well as having a numerous guests facilities and services including lounge bar, conference centre, direct internet access, faxing facilities, free car parking, guest laundry, gym & fitness equipment, restaurant, spa, outdoor swimming pool, tour desk, bbq, airport shuttle, security, 24 hour reception and daily housekeeping. The friendly staff at the Rydges Darwin Airport Resort are eager to assist you in making your stay a pleasant and enjoyable one. 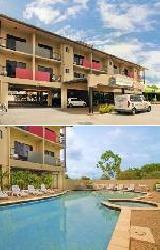 This Darwin apartment complex located in a quiet street in the Darwin CBD, the City Garden Darwin Apartments are only a short walk to the shopping mall, or on Thursdays and Sundays the famous Mindil Beach Markets in Darwin. The City Gardens Apartments are only an evening stroll away from one of our many restaurants, or watch the sunset whilst dining on the Wharf. For those more adventurous, tours will pick you up for trips to Litchfield and Kakadu National Parks, or for the not so energetic this affordable Darwin accommodation provide a lagoon style salt water pool which is always refreshing. If fishing's your game, Bill & Neville will point you in the right direction to catch the famous barramundi that are found around Darwin and other parts of the Northern Territory. 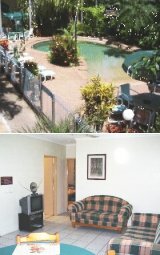 Do yourself a favour and escape the cold for a "stress free" holiday at the City Garden Apartments Darwin!! The Oaks Elan Darwin has a wide selection of luxuriously appointed hotel suites, as well as 1 & 2 bedroom self contained furnished apartments wirth views in the heart of the Darwin CBD. Ideal for singles, couples, families, holiday makers and corporate business travellers alike the Oaks Elan Darwin offers accommodation for any visit to Darwin city. The Oaks Elan Darwin is close to everything that the city has to offer, as well as having a numerous guests facilities and services including conference facilities, faxing facilities, guest laundry, gym, lift, restaurant, room service, outdoor swimming pool, tour desk, 24 hour reception, baby cots, daily housekeeping, laundry cleaning service, luggage storage, interconnecting rooms, photocopying services, concierge service, 24 hour room service, safety deposit box, facilities for disabled guests and non-smoking throughout the property. The Rydges Darwin Airport Hotel provides hotel accommodation & 2 bedroom self contained apartments that are conveniently located at the Darwin International Airport precinct, only 11km from the Darwin CBD. The Rydges Darwin Airport Hotel is Darwin's newest hotel, located within a short distance to the Casuarina Square Shopping Centre, which is the biggest mall in the Northern Territory. The Rydges Darwin Airport Hotel is close to everything that the city has to offer, as well as having a numerous guests facilities and services including lounge bar, business centre, conference centre, direct internet access, faxing facilities, free car parking, guest laundry, lift, restaurant, outdoor swimming pool, tour desk, airport shuttle, 24 hour reception, baby cots for hire and daily housekeeping. The 1, 2 & 3 bedroom executive self contained serviced apartments that are provided by the Miss Majestic Apartments are positioned in the heart of Darwin city, making them ideal for business or leisure travellers. The Miss Majestic Apartments are centrally located in the heart of Darwin, a short 5 minute drive from the Darwin Convention Centre, Skycity Casino and Bicentennial Park. The Miss Majestic Apartments in Darwin CBD is close to everything that the city has to offer, as well as having a numerous guests facilities and services including free car parking, guest laundry, lift, outdoor swimming pool, bbq facilities for guest use, security coded foyer and baby cots available for families. 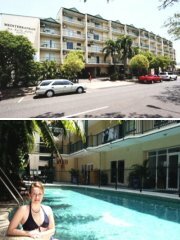 Marrakai Luxury All Suites is the premier inner city address from all Darwin's hotels. The Darwin hotel offers outstanding rooms, each of which are fully airconditioned two bedroom, two bathroom accomodation features a modern kitchen, huge dining lounge area, private laundry, kitchen with a dishwasher. The facilities in each boutique suite are siblime with each suite being individually decorated and offers a welcome home feel to the guests. 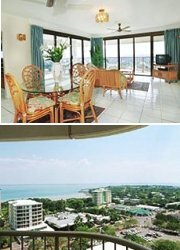 Guests enjoy panoramic views of both Darwin's city and harbour from their large L shaped balconies. Along with the accommodation balcony access is guaranteed for all suites, year round at Marrakai. On the ground level of the hotel, there is a large saltwater pool with spa and waterfall and a barbecue area with pergola. Parking is available in the basement of this property, which provides a great alternative to expensive 5 star Darwin apartments. 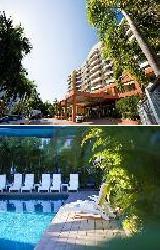 The Mediterranean All Suite Hotel offers Darwin accommodation in fully serviced self-contained suites. Some suites have twin person spa baths for true Territorian relaxation. All suites,situated in the Darwin CBD, have a full kitchen complete with cooking utensils, cutlery, and crockery. We offer 2 channels of complimentary in-house movies, tea/coffee making facilities, tour desk and more. Conveniently located on Cavenagh Street, let the Mediterranean All Suite Hotel become your home in Darwin by providing a stunning place to stay in the city. If you are looking for wonderful beach holiday accommodation in Darwin then you can't go past the Cullen Bay Serviced Apartments, which overlooks the magnificent Cullen Bay Marina and has superb views of the Darwin CBD, Timor Sea and nearby tropical parklands. The 8 storeys of this quality Cullen Bay accommodation offers business executives and holiday makers the choice of 1 and 2 bedroom apartments and affordable hotel rooms in a great Darwin location. All of the hotel rooms have an ensuite bathroom with shower, air-conditioning and balconies, whilst all of the apartments have a fully equipped kitchen and laundry facilities. The resort facilities in this complex includes a swimming pool, spa, childrens pool and guest BBQ housed within a large entertainment area. 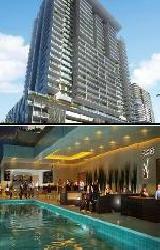 There is also free undercover car parking, 2 lifts and a 24 hour reception at the Cullen Bay Serviced Apartments Darwin. Aurora Coconut Grove Holiday Apartments offer Darwin accommodation in studio rooms and 1 bedroom apartments, which are fully self contained with separate bedroom, kitchen and private bathroom. Serviced once a week, all rooms are air-conditioned and facilities include colour TV, telephone, free in-house movies, refrigerators, iron and ironing board, tea and coffee. Continental breakfast avaliable. 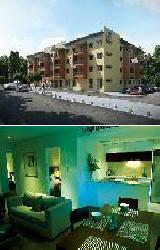 All units in this Coconut Grove accommodation have spacious balconies for guests to relax on. Coconut Grove Holiday Apartments Darwin are just 3 kilometers from the Darwin Airport, and just 10 minutes from the darwin CBD. Close to Casurina shopping centre, hospital, and Marra Sports Centre. 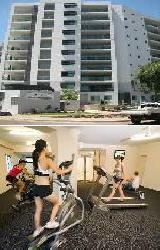 Approximately 5km from Charles Darwin University (direct bus route). Set admidst a lush garden of tropical ferns and palms: surrounded by a pool spa and barbeque area, the holiday apartments are a perfect setting for you to relax and enjoy the lifestyle of the Top End. The Casa on Gregory Apartments (formerly the Alkira Darwin) is a luxury Darwin accommodation resort that is located in the lovely inner city suburb of Parap. When visiting Darwin next why not stay out of the noise and hustle of the central city area and stay at the quiet and relaxing Casa on Gregory Apartments. This Parap accommodation is ideally positioned only minutes from the CBD and all of the major tourist attractions of Darwin. The suburb of Parap is a true tourism precinct close to all services and facilities including the Parap Village with it's quality retail stores, art galleries and an extensive range of bars, restaurants and nightlife entertainment. The Casa on Gregory Apartments' popular Boghart's Grill & Bar provides guests with a relaxed dining experience or the convenience of room service. The famous Saturday morning Parap Markets are found at Parap Village and operate all-year round. This Darwin resort offers guests a choice of Queen, Twin, Family, Executive or Spa suites that have been beautifully appointed with modern conveniences and also exude an environment of peace & tranquility. The Casa on Gregory Darwin has a tropical pool set in lush gardens surrounded by feature decks, a BBQ area, a fully equipped gymnasium, daily housekeeping and free car parking. 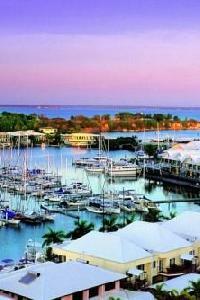 The Marina View Serviced Apartments truly is Darwin's waterside lifestyle experience. These Darwin apartments overlook the Marina at Cullen Bay and are only minutes from the Darwin CBD, Darwin Botanic Gardens and Casino. What makes the Marina View Apartments so good is that you get to choose from beautifully appointed 1 or 2 bedroom apartments with their own balconies, broadband wireless internet access, colour TV and in-house videos, air-conditioning and a fully equipped kitchen. Also the other facilities of this Darwin accommodation include conference facilities, entertainment area with swimming pool, spa, childrens pool and 2 guest BBQ's. Situated within easy walking distance of the Marina View Apartments Darwin are Cullen Bay's many shops, famous restaurants, Harbour Cruises and the white sandy beach. 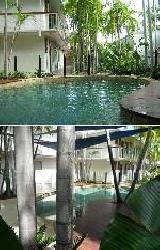 Luxury beach side apartment accommodation does not get any better than the Marina View Apartments Darwin. 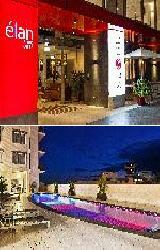 The Darwin Central Hotel is ideally located in the heart of the Darwin CBD. The hotel offers luxury Darwin accommodation that is close to the nightlife entertainment, restaurants and shopping of the Northern Territory caopital. With 132 boutique style hotel rooms the Darwin Central Hotel is the ideal base from which to explore all of the tourist attractions in and around Darwin, including the Kakadu National Park. The Waterhole Restaurant offers diners a contemporary dining experience that is second to none in Darwin. The Northern Territory has many natural wonders and an infinite variety of things to see and do, which makes the Darwin Central Hotel the perfect place from which to start your adventures. Located in the heart of Darwin's city centre, this cool and modern retreat from the outback sun offers a friendly, northern atmosphere and superior personal service for both the corporate and leisure traveller. The All Seasons Premier Darwin Central Hotel features rooms that are fully furnished with state-of-the-art decor to create a modern, cool and relaxing ambience in contrast to Darwin's tropical surroundings. Located around a soaring, eight storey atrium, the Darwin Central Hotel offers contemporary elegance combined with touches of outback lifestyle for discerning travellers who expect the best accommodation and will receive no less from one of the most spectacular Darwin hotels. 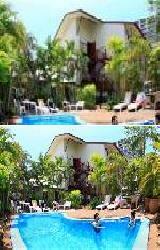 The Top End city of Darwin and the surrounding suburbs have lots of different places that are ideal for long or short term stays including the Mirambeena Resort, Crowne Plaza Hotel Darwin, Novotel Atrium Hotel Darwin, Holiday Inn Hotel Darwin, Poinciana Inn, Top End Hotel Darwin, Ti Tree Holiday Apartments Darwin, Palms Motel Darwin, Skycity hotel Darwin, FreeSpirit Resort Darwin, Howard Springs Holiday Park, Luma Luma Holiday Apartments Darwin and the Cavenagh Accommodation Darwin. In order to book in at these or any of the other hotel accommodation in Darwin then click here to make an enquiry.